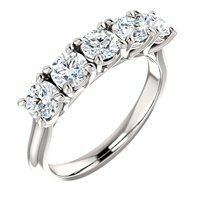 From plain classic wedding bands to unique diamond and modern bands weddingbands.com provides largest selection of wedding bands for men in gold, palladium and platinum. Times are changing and so does men's fashion. Fifty years ago, men mostly wore plain and simple men's wedding bands or rings. Some might have few small diamonds and carvings; that was all. 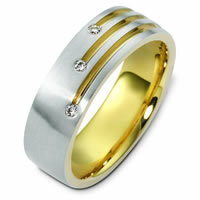 Today wedding bands for men are made with different metals from gold and platinum to titanium and cobalt. They are made with different precious and semi-precious metals even out of wood. Shop plain classic wedding bands for men. Search the huge Selection of unique designs titanium men's bands. The CAD-CAM design centers and CNC machines helped in creation of unique wedding bands for men in unique metals and material. WeddingBands.com uses technology and human creativity to manufacture and sell the most unique wedding rings for men. 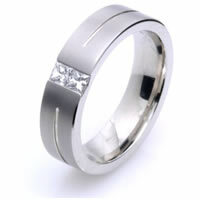 We manufacture men's wedding rings using the finest quality diamonds and excellent workmanship. At WeddingBands.com, we can customize the ring to your specifications and we can manufacture the ring with the precious metal or metals combinations of your choice. Our precious metals are recycled or responsibly mined. 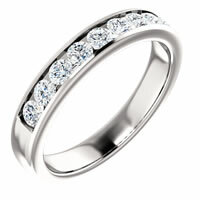 All diamonds used in our men's wedding bands are conflict free diamonds. All wedding bands for men come are shipped with a beautiful wooden box, certificate of authenticity or appraisal. 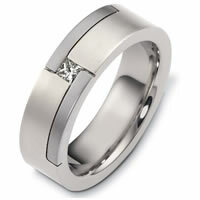 We have over 6000 wedding bands and rings to select the perfect ring for him. 14K Diamond Men's Wedding Band.